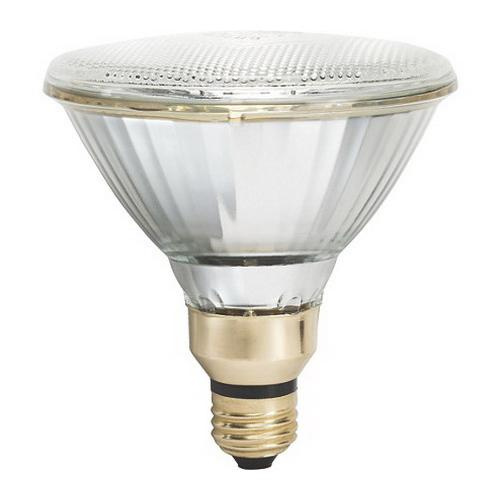 Philips Lighting MasterColor® CDM 100-Watt PAR38 E26 single contact medium screw base metal-halide lamp offers 6200 initial Lumens for crisp light output. It has voltage rating of 90-Volts and 1.1-Amps lamps. This lamp in clear color, has color rendering index of 92. Lamp with 3000K color temperature rating radiates warm white light to the surrounding. It measures 5.28-Inch x 4.75-Inch Dia. Lamp delivers average life of 16000 hours. It emits or distributes light at beam angle of 15-degree. The cap-base of this lamp withstands temperature of 190 deg C.